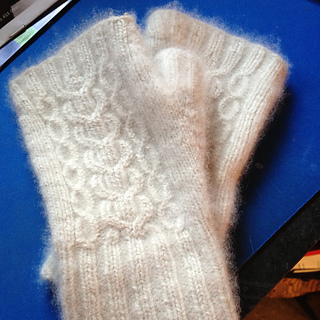 Lovely mitts with a Bavarian twisted stitch cable combination on the back of the hand, knit from the cuff up with gusseted thumb and 2/2 ribbed edges. This pattern is presently available from Ravenwood Cashmere in a kit with Ravenwood’s domestic, naturally-processed 100% cashmere yarn. It is now also available separately for PDF download purchase.